She and her husband were thrilled to find out that you really don’t need to buy wood and build frames for raised beds. They use only a minimal amount of mulch. From what she tells me in her emails — Lisa and her husband know they are doing much more work than they need to do and could get better results with less work if she knew how. In the process of searching for a better way — she was attracted to raised beds thinking maybe they could produce more, and have fewer, healthier plants in a smaller space. They have two plots– each is 60 feet x 80 feet or 4800 sq. feet. Two times 4800 sq. ft. brings the total garden area to 9600 sq. feet. That’s only a thousand or so feet shy of being 1/4 acre. To compare — my vegetable garden area — which also contains 8 blueberry bushes, at least 120 sq. feet of asparagus beds and many perennial flowers — is 40 x 60 or 2400 sq. feet. Even if I add my strawberry bed and other spots for various vegetables outside the garden it only comes to about 2700 sq. feet. We eat LOTS of vegetables. And in season — we eat almost exclusively from our garden. In addition I put up strawberries, blueberries, beans, tomato sauce, spinach, peas, some squash, onions and various other things to feed us most of the winter. I feed two people. Lisa feeds 4 people. I was glad to learn from Lisa’s email they had started working with cover crops. It’s my understanding that the area in the picture you see below is currently planted with crimson clover. That will be excellent for the soil and will attract beneficials as well. In the past, I’ve underplanted tomatoes with crimson clover to act as a living mulch. I kept it trimmed to about 6 or 8 inches rather than letting it get up taller. Shorter white dutch clover is another option which is said to do especially well in clay and/or silt soils. It’s used a lot for a living mulch since it tolerates foot traffic. I’ve outlined wildflower beds with it in the past and plan to grow it in some of my garden paths this year. They’ve also grown rye — which is excellent for soil improvement. The biomass of winter rye can be cut and put back onto the bed as mulch or used in the compost pile. The decaying roots (left in the ground after the biomass is cut) can act as a mulch for beds with warm weather crops like tomatoes, peppers, cukes, and squash. The variety of crops that you can use to enhance your garden is amazing: legumes (peas and beans), clovers (red, white, yellow), alfalfas, small grains (wheat, rye, oats, barley), buckwheat, kale, oil seed radish, and Sudangrass. I haven’t gotten to all of them yet, but I’m definitely working in that direction. To get the broadest range of benefits for your garden — diversity in cover crops is a main key. Readers garden space in March. Lisa and her husband have been gardening organically for 11 years. I am assuming that by organically — she means they do not use harmful chemicals to “fertilize” or to kill pests. Thus – she would indeed be keeping the letter of the law. Greater rewards come when you keep the spirit of the law. There are alternatives to each component necessary for gardening. You’ll be greatly rewarded if you chose methods that replicate and respect nature. By making her your partner she’ll do most of the hard work for you. If you work in opposition to what her natural ways are — it’s a given that you’ll loose the battle. 8 months of flowering blossoms on shrubs, trees, and flowers within at least 50 feet of the garden. They will attract and provide habitat for pollinators and predatory wasps/flies/beetles. When the soil is tilled — or even if there is a lot of digging going on with a shovel — much of the soil life is killed. Over time the soil life will build again if organic material is replenished, the soil is kept covered, and it’s not severely disturbed again. When ground for a garden is first “opened” it should be loosened deeply. Done properly deep soil preparation should be necessary only one time. To continually till the soil each year keeps nature from doing all she can to help your garden be the best it can be. Every time you till you destroy much of the soil web (soil life) that was just starting to rebuild itself. Permanent beds that have organic materials added to them each year and are always mulched (replicating nature) allow the activity of soil life to increase continually and thus — improve your garden. allows the nutrients in the soil to be better used by the plants. In other words – nature will be making your garden stronger and better. And one of the most rewarding advantages is when you go out in the spring: All you need do is to pull back the mulch where you want to plant — and plant. That’s it! No other work needed! And within a year or two the garden should be weed free with about 5 or 10 minutes of attention to weeds every day. The outer perimeter will be the area that most weeding will have to be done. Keeping that area heavily mulched and then weed eating (with a weed trimmer) the outside edge will make it much easier AND will enhance the beauty of the overall garden. By preparing permanently raised beds, replicating nature with mulch over the entire garden, and using a broad variety of cover crops available to improve their soil as well as obtain their mulch, and having bloom to attract beneficials —– they’ll have a garden that is beautiful, productive, high reward and low maintenance. Contained Raised Beds – No Way! Organic Gardening is easy, effective, efficient — and its a lot healthier. All content is copyrighted by TendingMyGarden.com. All Rights Reserved. Oh, to have such a lovely space, Theresa! And so much of it. Sometimes, though – I imagine it could be overwhelming. It IS amazing how much food a small space can pump out. I know I was astounded at what my garden gave me to eat last year, with just a few of the adjustments you suggested. I’m looking forward to incorporating more of your ideas into my garden for even greater productivity this year. Thanks for the confirmation Sandra. These folks could have a real “traffic stopper” of a garden with just a few adjustments — not to mention the productivity possible! Thank you for the very informative post. I think it is fabulous that you work so hard to help others with their gardening endeavors! So far we only have three beds started, they are about 4’x 8’. – we are waiting for a dry spell so we can get started on the rest, it has been very wet and cool these past few weeks. One of the beds has kale and kohlrabi in it and I transplanted strawberries from another plot into the other two beds. About 2/3 of our land is wooded, so we have some flowering trees/shrubs close to the garden. We already have several blueberry bushes and 14 young apple trees, they are not in the garden but they are fairly close to it. In the past we planted a wide bed of sunflowers and another wide bed herbs and flowers that attract beneficial insects (cosmos, dill, cilantro, fennel, etc.) on the edge of our garden plot. After the frost, we cut them back and till them in. So far, they have come back on their own each year. So, we do have some beneficials in the garden. However, I look forward to moving them into raised beds this year. Because they are on the edge of the garden, keeping these wide rows weeded (especially wire grass) has always been a difficult task. We also have some larger beds around our house where we have planted native perennial flowers, grasses and shrubs as well as some culinary and medicinal herbs. We keep honeybees so we like to plant species that provide a lot of forage for the bees. We have been adding a few plants each year – these beds are definitely a work in progress. I like your suggestion to move our compost pile into the garden. Right now we have it in a separate location and we cart compost to the garden. However, our compost bin tends to attract crows and I am sure it attracts other little animals. Do you think it is a bad idea to draw theses critters directly into the garden? We are also going to try under planting cover crops. I think this will be very helpful, especially since we will not have a lot of material to use for mulch this first year (still have not found a local source of spray-free straw). In addition, we will focus on planting some perennial flowers and herbs in the garden, specifically species that attract beneficials. Oh yeah, raspberries and asparagus are also on the list. Do you have any additional suggestions for our first year making the transition to permanent raised beds? Thank You Theresa, you have already provided us with a great deal of inspiration!! Lisa, I was glad to hear from you. It’s grand that you already have flowering trees and shrubs close to the garden to attract bees and beneficials. I thought it especially wonderful to learn that you already have several blueberry bushes and 14 young apple trees! Also good that you plant herbs and flowers that attract beneficials. Regarding your tilling every thing in: Another point to remember is that beneficials need more than just bare soil to stay around. They need places to be protected from the elements during and after the growing season. In my garden that’s the old foliage on some perennials — and after old man winter takes even that away — they can still stay with those plants under mulch. Your compost pile should NOT be attracting crows or critters. We have a family of crows (they’re a pain) in our area. I’ve never seen them in my cold compost pile and I’ve never had them attracted to areas where I dig in kitchen scraps. As far as voles and shrews are concerned — they are in my garden but not because of any compost. I trap them when they get out of hand but again — they are not specifically there for anything that would involve composting. They only time crows or critters have bothered is when I set my bowl of kitchen scraps out to take to the garden and then forget it until the next morning. This will bring the crows —- also possums will come. As I said, I’ve never had crows or critters attracted to my cold compost. If you have a hot compost pile you definitely should NOT have crows or critters in it. You probably already know — but never put anything with meat or meat products in a compost pile. That attracts critters. Also — you should have your kitchen scraps covered well with heavy mulch even in a cold pile. I’m in the process of writing another post that I think will help you (and a LOT of others) — on Straw — Does it have to be organic? I’ll get it up as soon as I can. Seeing through my eyes — lack of mulch is one of your biggest problems right now and you need to take massive action to remedy this as you walk towards permanent beds. Under planting cover crops is just excellent and I suggest sticking to that plan EVEN AFTER you obtain an adequate supply of mulch. A suggestion about raspberries: You may want to keep them out of the garden. I have mine at one end of an island bed outside my garden that accommodates other things as well. As you know raspberry roots spread underground and can send out new canes even a good distance from the original plant. No point in having to deal with that in the garden. And if you ever had a year that you were unable to pay strict attention to what was going on — you’d have a jungle of raspberries. You asked if I had additional suggestions for your first year making the transition to permanent raised beds. I wish I had even more information on how and what you are doing so that I could better answer that. I’m sure I’d have a lot more ideas to offer. 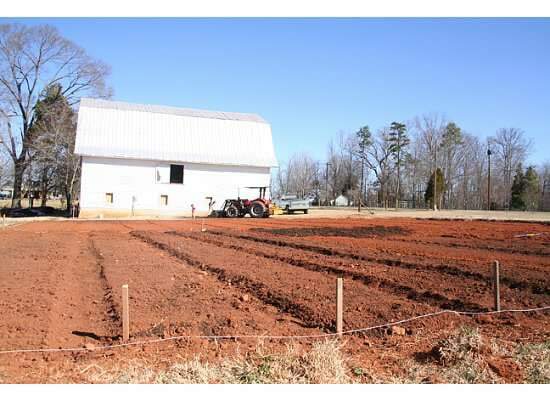 You may want to read my various posts on soil preparation to see if there is anything else in them that may make your job easier and also to see how the information given in my posts compares to what you are doing. I hope you will keep me informed on how you are doing and progressing. Thank You for the info on composting. We do not compost meat. Yet, we usually wait a little while before mixing the kitchen scraps into the other compost pile, in order to give them some time to decay. It sounds like that is where we are going wrong in terms of the crows. Right now we have two compost piles each at different stages of decomposision. We will take your advice and bury the kitchen scraps into the compost or lay them under mulch when we move our compost pile to the garden this year. Also, I plan to send you an email about some of the other things we are doing and planning to do in terms of soil preparation real soon. Thanks again, you have already been very helpful and inspiring. I look forward to your email Lisa.